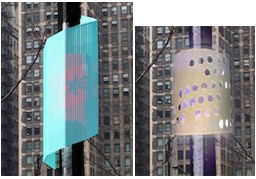 The Windy City is activating sensors on light polls that will track and count people, anonymously, by their cellphone emissions. 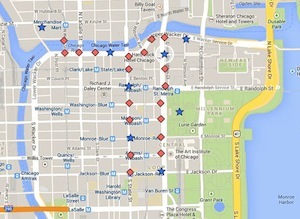 Locations for the first Array of Things sensors in Chicago. This isn't a story about lighting, or only tangentially so, as many municipalities and businesses are considering how they can leverage LED upgrade projects to provide sensor arrays for various purposes. Chicago's "Array of Things" initiative doesn't begin with lighting; just with the city-owned light poles. The project is spearheaded by the University of Chicago's Urban Center for Computation and Data. Here is a 7-minute video of the project's lead Charlie Catlett, summarizing the project at the OpenGov Hack Night in Chicago on June 17. The sensors won't include cameras... Before adding any new sensor, the project will seek community input and expert advice. And all the information gathered will be immediately public, allowing watchdogs to raise alarms about potential intrusive collection or activity. And all the data will be made public in real-time. This "urban big data" will be available to researchers, commercial interests, and ordinary people to do with whatever they can imagine. Two possible designs for Array of Things sensors. Later this summer, 50 sensors will be installed in the Loop area of the city, with a few hundred more to follow over a wider area in the next few years. They will be wrapped in artistic enclosures designed by the School of the Art Institute of Chicago. Some representative designs are shown at left. The sensors will measure air quality, sound volume, light intensity, precipitation, heat, and wind; "the sensors will also count people by measuring wireless signals on mobile devices," as the Chicago Tribune reports. The only data stored will be the count of devices within range (Bluetooth or WiFi) over time; no identifying information will be picked up. It seems curious to me that the city wouldn't fold control of street lighting into such a project. The Array of Things has been under development for four years, about the same amount of time that Chicago has been moving forward with LED street light replacement, but it seems the two projects have been and remain disjointed.